Is hair thinning your concern? Try Power Grow Comb. It is a hair brush with integrated laser technology that stops hair loss and promotes new hair growth by stimulating and regenerating the surface of hair follicles. The red and blue energy diodes go deep into your scalp to nourish and revitalise your scalp which increases capillary blood flow and eliminates the DHT that restricts the hair growth. 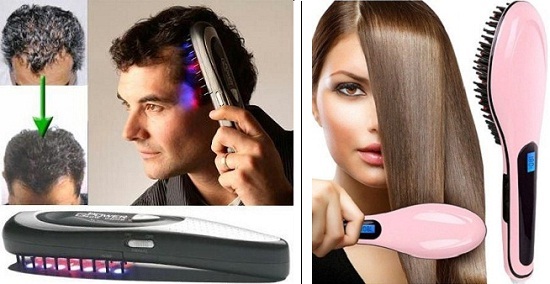 The digital hair straightener combines a hair straightener and comb. It improves the quality of your hair and makes your scalp healthier. Worried about the stains on your teeth? 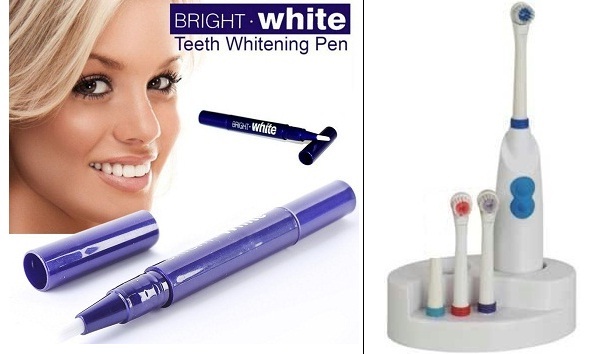 use this professional teeth whitening pen as it has been designed and recommended by dentists. It eliminates the stains on your teeth. Apply a thin layer and let the gel dry on the teeth for a minute. Do not drink or eat anything for 30 minutes after using the teeth whitening pen. Goodbye teeth stains. This electronic toothbrush set comes with 3D round bristles which reduce plaque and removes stains to give naturally white teeth. Protect your shiny thirty-two with these tooth care products. Why visit beauty parlour for a pedicure treatment when you can do it at home! 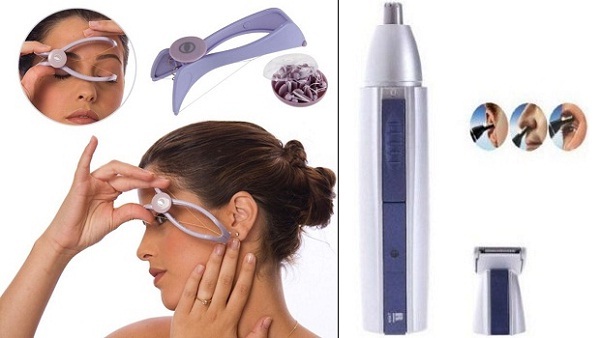 The first kit consists of a pedicure paddle and a steam vaporiser. The paddle brush cleanses your feet including toenails. The pumice stone evens out callused feet. The metal file eliminates dead skin leaving your feet smooth and soft. The Skoother Skin Smoother is the fastest and most effective way to smooth rough skin and callouses. With its micro-abrasive smoothing screen, the Skoother removes just the right amount of callused, rough skin without going too deep into the fresh skin underneath. These products allow you to do a pedicure at home. Made a last minute plan and running out of time to get rid of your facial hair? Don't worry! This threading kit is an amazing and painless hair removal technique without skin irritation. It plucks out hair from the root which results in slower hair regrowth. If you have visible hair on your face, this trimmer is the best solution for trimming nose, ear and facial hair. Ever wondered what stops you from having a peaceful sleep? If it's snoring, try this anti-snore nose clip! It actually works! It gets attached to the nose and fits easily. It stimulates the sensory nerves of the nose which opens the nasal passage thus preventing snoring. If you are unable to sleep due to that dim light on, you can wear the eye mask which is tight enough to keep out any disturbing light. This is a great travel accessory. With summer getting closer, you need a bottle of deodorant in your bag at all times to stay fresh. For women, a perfumed talc would do the trick. Finding it difficult to get into that favourite dress of yours? Wear this shapewear gives you a proper shape by flattening your tummy instantly. The fitness wear comes with a hot shaper belt that helps your body melt harmful fats by the way of sweating.